At Dean Street Dental all types of dental restoration are performed. Dental restorations are used to restore lost tooth structure due to decay, breakage or fracture. The most common material is composite which is tooth-coloured and aesthetically pleasing. 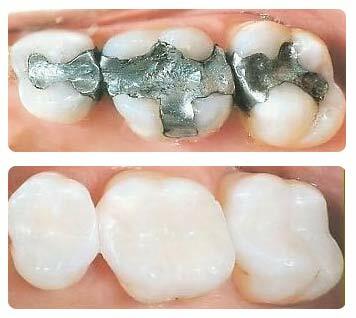 Unless the patient is a tooth grinder the wear rate is the same as amalgam (Silver fillings). Composite is a direct restoration, that is, the dentist places it directly into the tooth. Glass ionomer cements, which are also tooth-coloured and cosmetically pleasing, are also a popular restorative material and very good for children’s teeth and in areas that are not load-bearing. A different type of restoration is the indirect restoration. Here the dentist prepares the cavity and then takes impressions from which stone models are made. The restorations are made in either porcelain or gold in a laboratory and cemented at a later date. In the intervening period the tooth is protected by a temporary dressing. Root canal treatment is a means of saving a tooth that may be damaged by decay, fracture or infection. The purpose of the treatment is to restore the tooth and surrounding tissues to health, relieving both pain and infection, as opposed to total tooth removal. A root canal treatment is needed when the pulp (the soft tissue inside the tooth) becomes inflamed or infected as a result of injury, deep decay, repeated dental procedures on the tooth, or a cracked or chipped tooth. Most patients who have had a root canal performed describe the procedure as virtually painless. As long as the tooth is properly anaesthetized it should not be sore at all. Root canal treatment should be thought of as a complicated filling. No more than that. However a severely infected tooth can be difficult to numb up completely so a course of antibiotics is often prescribed first, and later when the tooth has completely settled it can be comfortably treated. Root canal treatments are a better and common alternative to tooth extraction. When performing a root canal, the dentist removes the inflamed or infected pulp, carefully cleans and shapes the inside of the canal (a channel inside the root), and fills and seals the space. After completion of this procedure, a permanent restoration is placed. If the tooth is heavily filled it may require crowning at some stage following root treatment. Often a tooth changes colour when it has been root filled. If this is towards the front of the mouth you may prefer to have the tooth crowned to restore its colour and to improve the strength of the tooth. After restoration, the tooth continues to function like any other tooth. I had a filling done recently and now I need a root canal treatment. Why?